Pairs of socks with one sock missing are pretty common in all households. Honestly, one actually does not know what to make of the missing pair. Mostly, people avoid throwing it away in hope that the other might just be found. So the sole socks end up being stocked in the basement till the missing shows up miraculously. Occasionally, when you find your kids getting bored one fine day, you may just use these creatively. Get those missing pair socks and the craft material out to create some sock puppets and enjoy. Wash the socks to clean them up. Socks that smell nice will be better to work with. Socks of any size and color will do as long as these fit your kids’ hands. Adult socks would be preferable. The first step will be the hair of your sock puppet. For this, cut twelve inches strands of yarn that can be bundled on top of your sick by your kids or glued one at a time. This will be an awesome opportunity for your children to unleash their creative side. If they wish to glue the strands and scatter them all over the sock, allow them. There are no hard defined rules for making a puppet. It is even a chance for you to set the child in you free. To attach the hair strands firmly, it will be most appropriate to sew them onto the sock. You will have to do this yourself or supervise your child in this step. However, if your kid is old enough, let him sew himself for this will improve his hand-eye coordination. Place your hand in the sock so that you don’t sew up the other side of your sock together with the one you are sewing the hair strands on. To make the puppet’s eyes, use either wiggly eyes or permanent markers. In case the kids prefer wiggly eyes, ask them to glue the same and to use permanent markers to depict eyelashes of your puppet. Make use of the glue to add on any other decorations that you prefer. Let your kids draw the mouth on the sock puppet with a permanent marker themselves. You can even use the yarn to shape it like a mouth and paste it using glue. Allow your kids to draw on the teeth of the puppet or glue them on with anything they feel is appropriate for the same. 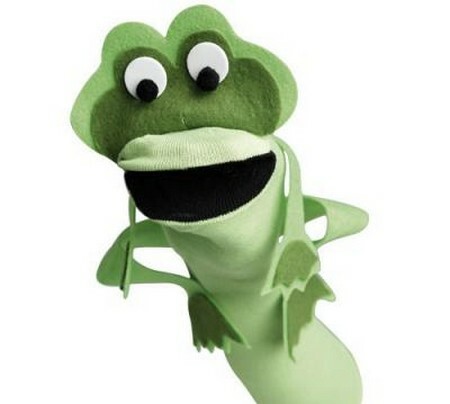 Making a sock puppet is all about fun, entertainment and creativity. In case the end product is something even worse than the raw material, then that will just be your pre meditated opinion. Think only about all the happiness and laughter and skill that you as well as your kids put in and suddenly even the most boring looking puppet will seem worth the whole effort.